Lower Reule Bioenergy is closely linked to several other companies that operate in the local area. 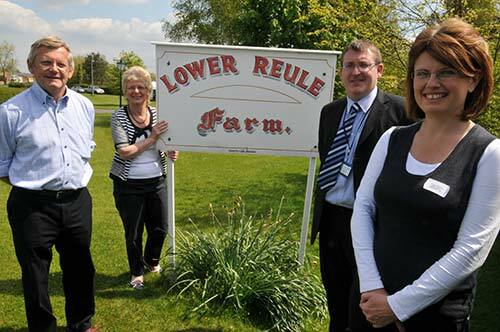 Lower Reule Farm Ltd manages an area of 500 acres. Originally a mixed livestock farm with a stock count at one time of more than 10,000 pigs, the farm has diversified into growing, picking and packing strawberries for a number of the major supermarkets. The activities of the farm and AD site are closely linked as the nutrient rich PAS110 digestate produced during the process is applied to the surrounding land to improve crop yield and soil structure. This relationship significantly reduces the reliance on inorganic fertilisers that are expensive and energy intensive to produce. Click here for more information. Buttercross Farm Foods was set up by Martyn and Helen Rowley with the backing of Ian and Carol Critchley of Lower Reule Farm. The farm supplies free range, outdoor reared, quality pork and beef and has gone from strength to strength since its creation in 2000. The Buttercross Farm shop stocks a great range of their own free range pork, bacon, sausages and ham, as well as quality produce from acclaimed local food producers. To find out more visit their farmshop at www.buttercross.com.